Developed by Brendon Chung, the master storyteller behind Gravity Bone and Thirty Flights of Loving, Quadrilateral Cowboy is the next chapter in Blendo Games’ series of titles set in a retro futuristic world of portable vinyl players, flying motorbikes and morally dubious protagonists. 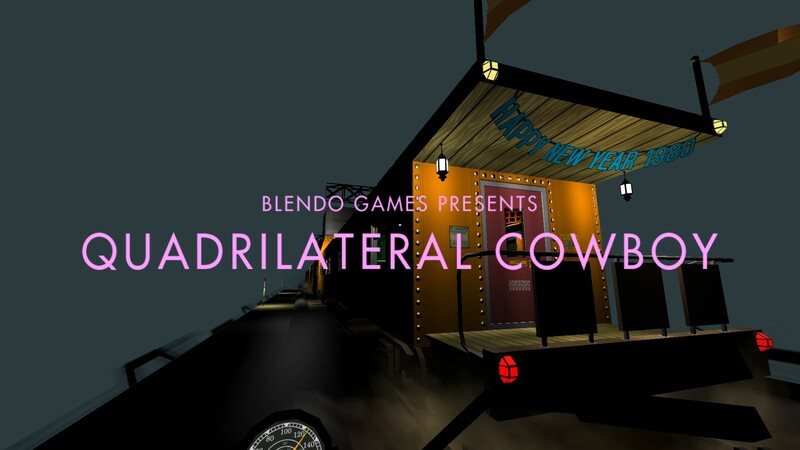 The big difference between Quadrilateral Cowboy and its predecessors, however, is that it’s a fully functional game, with clearly defined objectives and gameplay mechanics, instead of the “walking simulator” approach employed by the developer with his earlier work. 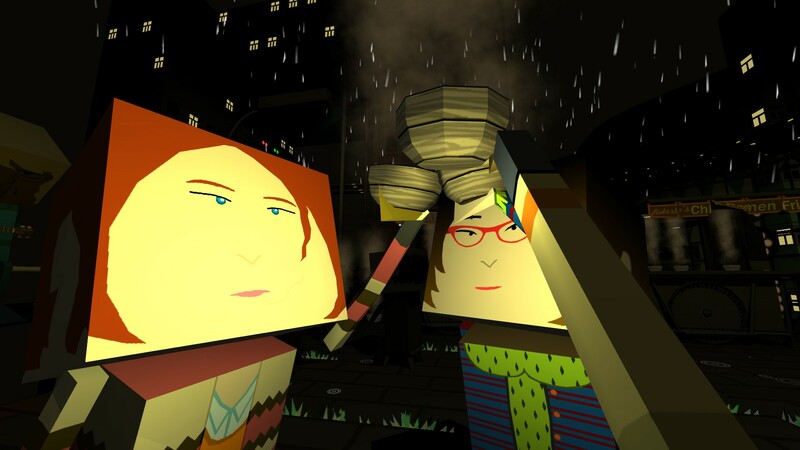 Brendon Chung’s latest title is an adventure game disguised as a puzzle-solving experience. We play as a recently graduated engineer dabbling in computer hacking and engaging in a series of high stakes heists. From the beginning of the game, we can see that Quadrilateral Cowboy’s world diverged from ours at some point, as it’s set in the 1980s, but there are flying motorbikes and VR seems to be a fully functional thing. Computers must still be controlled through DOS-like interfaces though, something that fits the cyberpunk theme perfectly, and adds a tactile dimension to our interactions with the game world. The beginning of the adventure will teach players how to hack doors and other objects in the game world, using a portable hacking deck that must be deployed and then interacted with. The act of hacking feels real thanks to the use of believable commands typed on the portable computer’s miniature keyboard and displayed on its screen, and after a few small “test” levels, most gamers will be typing commands as if they were real life hackers. Quadrilateral Cowboy is quite similar to Portal, introducing a new gadget, building a level around the use of that tool and then seamlessly adding it to the player’s arsenal as a thing that may or may not be used to complete later puzzles. This is usually something good, but at some points it feels like the first half of the game is a tutorial for the latter part of the adventure. Luckily, the story is intriguing enough to carry the “tutorial” parts, and the strangeness of the environments ensures that the player never feels bored, even with the most basic tasks. Between each mission, we’ll be taken to playable intermissions which usually take only a few seconds (though the player can always explore the environment at their leisure) and through those scenes we can learn more about the world, our character and her friends/associates. For instance, we can discern that even though our character is a recently graduated engineer, the city of Nuevos Aires has no need for her skills (or her friends’ skills) and that’s the reason for her criminal activities. As the game progresses, the plot’s pace quickens, the stakes are higher and we get to play through complex levels that make use of all the gadgets acquired along the way. Sadly, not everything is perfect, as Quadrilateral Cowboy seems to be a quite buggy piece of software (picking up gear in order to stash it may trigger crashes for no apparent reason) and some players may feel that the duration of the game is a problem (I got through the game in four hours) Still, even with those caveats, I believe that Blendo Games’ latest adventure is one of the most enjoyable titles of 2016, and I can’t wait to see what Brendon Chung’s got planned for the future.